ethics complaint « Hercules and the umpire. I have earlier written about the ethics complaint filed against Judge Edith Jones. Judge Jones, who I have only met once, is a tough and “conservative” judge who sits on the Fifth Circuit. She formerly served as the Chief Judge of that court. She is very bright, and very opinionated. Her writing and her speaking styles can be blunt. Frankly, she is far too right-wing for my tastes. The student-run chapter of the Federalist Society at the University of Pennsylvania Law School invited Judge Jones to speak about the death penalty. The Federalist Society chapter advertised the event within the law school and to the public as a discussion of “federal death penalty review through the perspective of a federal judge.” Judge Jones delivered the lecture, entitled “Federal Death Penalty Review with Judge Edith Jones (5th Cir. ),” on February 20, 2013. She spoke for about 45 minutes and then answered questions. There was no recording of her talk or the question and answer session. Various individuals and public interest groups filed a Complaint of Judicial Misconduct against the judge. The Complaint primarily centered on alleged misconduct arising from remarks Judge Jones made at the lecture on the death penalty at the University of Pennsylvania Law School on February 20, 2013. The complaining parties did not like what Judge Jones said, so they filed the ethics complaint against her. The Complaint grouped Judge Jones’ contested comments into the following categories: (1) “Comments on Race”; (2) “Comments on the Intellectually Disabled”; (3) “Comments on [Claims] of Innocence”; (4) “Comments on Foreign Nationals”; (5) “Discussion of Individual Cases”; and (6) “Discussion of Religion as a Justification for the Death Penalty.” It also alleges that the judge: (7) improperly criticized the U.S. Department of Justice; (8) “disparaged” the Supreme Court; and (9) delivered her remarks in an inappropriate tone. In these respects, the Complaint maintains, the judge’s lecture violated 28 U.S.C. § 351 and Code of Conduct Canons 1, 2, 3, and 4. While its only my opinion, even if one takes the facts stated in the affidavits as generally true, the content of Judge Jones’ remarks at the law school seem to me to be a very weak basis for claiming that she violated the Code of Conduct. Indeed, I find it more than a little frightening that a serious but plainspoken and outspoken judge like Jones can be forced to defend herself for the content of a law school speech on the death penalty that offended some of the audience members. Richard G. Kopf, The complaint against Judge Edith Jones for her death penalty speech, Hercules and the umpire (June 5, 2013 (asterisks (footnotes) omitted). At the request of the Chief Judge of the Fifth Circuit, this matter was submitted to Chief Justice Roberts for transfer to another Circuit Judicial Council. The Chief Justice referred the complaint to the Judicial Council of the District of Columbia Circuit. In turn, a “Special Committee” was appointed consisting of D.C. Circuit Chief Judge Garland, Circuit Judge Griffith, and Chief Judge Roberts of the United States District Court for the District of Columbia. On August 6, 2013, the Committee appointed Jeffrey Bellin, Associate Professor of Law at William and Mary Law School, as Special Counsel to the Committee to investigate the Complaint’s factual allegations. The Special Committee issued a 71-page single spaced opinion recommending that the entire complaint be dismissed. The Judicial Council of the D.C. Circuit ( GARLAND, Chief Judge, U.S. Court of Appeals for the District of Columbia Circuit; KAVANAUGH, SRINIVASAN, MILLETT, and PILLARD, Circuit Judges; ROBERTS, Chief Judge, U.S. District Court for the District of Columbia; A. JACKSON, CONTRERAS, and K. JACKSON, District Judges) followed the recommendations, and the complaint was unanimously dismissed on August 12, 2014. We now know the identity of the complaining parties as they have “appealed” (called a “Petition for Review” under the relevant rules) and they have made their appeal public. The complaining parties are: League of United Latin American Citizens (LULAC), by Luis Roberto Vera, Jr.; NAACP – Austin Chapter, by Nelson E. Linder; National Bar Association, Dallas Affiliate – J.L. Turner Legal Association, by Tatiana Alexander; Texas Civil Rights Project (TCRP), by James C. Harrington; La Union del Pueblo Entero (LUPE,) by Juanita Valdez-Cox; Charles W. Wolfram, Professor Emeritus, Cornell Law School; Author, Modern Legal Ethics; Renato Ramirez; Professor Robert P. Schuwerk, Co-Author, Handbook of Texas Lawyer and Judicial Ethics; Susan Martyn, Distinguished Professor of Law & Values, University of Toledo College of Law; Ronald Minkoff, Frankfurt Kurnit Klein & Selz; Past President, Association of Professional Responsibility Lawyers; Ellen Yaroshefsky, Clinical Professor and Director, Burns Center for Ethics in the Practice of Law, Cardozo School of Law. Their “appeal” will go before the Committee on Judicial Conduct and Disability of the Judicial Conference of the United States. See here (near the bottom of the page, click on Rules for Judicial-Conduct and Judicial-Disability Proceedings and read Rules 21 and 22). The Order of dismissal, the Report of the Special Committee, the “Appeal” and the supporting affidavits for the “appeal” are reproduced as follows: dismissal; appeal; and affidavits. These are PDF documents, and one must click on the link to view (by download) the document or documents of interest. Many thanks to Howard Bashman at How Appealing for collecting these materials. An alternative method of accessing these documents is to go to Howard’s post which may be found here (“”Federal panel dismisses complaint against Houston judge”). The work of the Special Committee and Professor Jeffrey Bellin makes me proud to be a federal judge. The clarity, tone, thoroughness and objectivity which is evident in the Report of the Special Committee is remarkable. 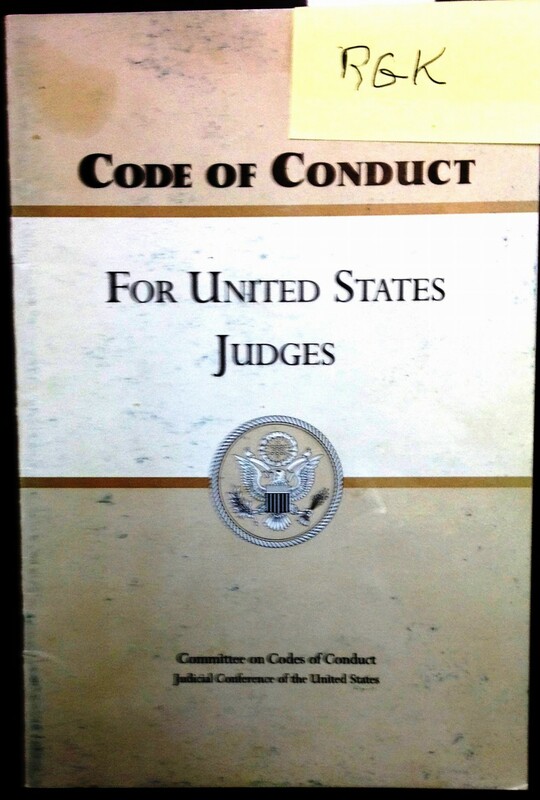 Having spent six years as a member of the Codes of Conduct Committee, it is my opinion that the Special Committee’s report reflects a sophisticated understanding of the Code of Conduct For United States Judges. In my opinion, the essential allegations of the complaint lack a credible factual basis. With the aid of Professor Bellin’s searching investigation, the Report of the Special Committee, in restrained terms, explains why that is so. I fear that complaints like this one will chill, and may even be intended to chill, judicial speech concerning the law, the legal system, and the administration of justice, particularly when the judge does not share the jurisprudential or ideological views of the listeners, and despite the fact that federal judges are expressly encouraged under the Code to speak about the law and how to improve it. Id. Commentary to Canon 4. As distinguished from my fears expressed in the preceding paragraph, the Report of the Special Committee does a skillful job of explaining why controversial speech by a federal judge in the context of a talk on the law does not violate the Code. I especially urge all federal judges and federal practitioners to read the Report of the Special Committee. It would be good also to read the complainants’ “appeal” and the supporting affidavits, although frankly those documents leave me entirely unpersuaded. Finally, the Judicial Council of the D.C. Circuit, and particularly the members of the Special Committee, deserve high praise for teaching us a lot about federal judicial ethics in the real world. Yesterday, I posted about the ethics complaint filed against Judge Edith Jones for a speech she gave at a law school regarding the death penalty. Her talk seemed dissonant to a few tender-eared lawyers and law students. They apparently went to the gathering on the mistaken belief that the judge was there to direct a sing-along of the more mellifluous “Kumbaya.” That got me thinkin. Since the judge is from Texas (and we all know precisely what that means), I bet she has an ugly truck. As of now, however, she has not submitted a photo for consideration in my ugly truck contest. To be perfectly clear, it’s not an excuse that she’s busy defending herself for being frank.